When the world's second-largest economy begins to show signs of trouble, it's time to take a step back and rethink things. China's growing debt problems have become clear... enough so that two of the world's foremost credit agencies just fired warning shots heard around the world. There are three major credit rating agencies based in the U.S.: Standard & Poor's (S&P), Moody's and Fitch. They're known as the Big Three and are widely recognized authorities in global credit markets... especially here in the West. This year, China has suffered two blows to its bond market. The first strike occurred several months ago when Moody's dropped China's credit rating from Aa3 to A1. Based on Moody's rating model, China's debt is still "investment grade," but its default risk has risen enough to justify a rating change. Moody's outlook isn't the only one that has soured. Last month, the S&P also issued a rating downgrade from AA- to A+, citing concerns that China's economic strength is weakening. Say your monthly bills are steadily rising but your salary growth is flat. At some point, your salary won't be enough to cover your growing expenses. And you'll likely end up paying bills late or skipping them altogether. In short, Moody's and the S&P are telling us that China's debt growth is a problem. China's GDP growth hasn't quite flatlined... but it has steadily declined. In fact, China's GDP growth has dropped to less than half of what it was a decade ago. It's floating just above its 2009 lows. 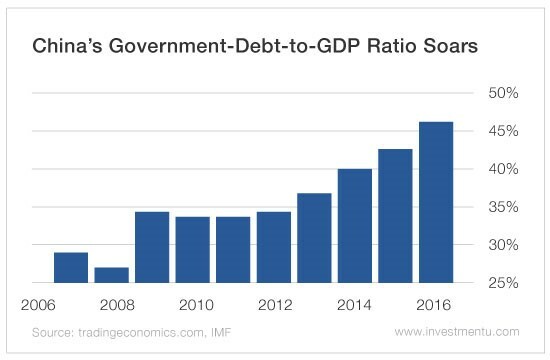 And as China's GDP growth is shrinking, its debt is bloating. In 2007, China's government debt was less than a third - 29% - of its GDP. It's now nearly half - more than 46% - of GDP. But that's just its government debt. If you factor in other debt - corporate, household and banking - that figure jumps to more than 250%! No country can escape the laws of economics forever. Eventually, those trends could put China's bondholders in an uncomfortable spot. But despite the healthy dose of skepticism... China's permabulls seem fully inoculated to the facts. As I mentioned earlier, these downgrades make sense. In theory, changes to credit ratings matter because they change investors' risk assessments. A riskier asset requires higher potential returns to attract investors. That means a downgrade should - again, in theory - result in higher bond yields. But that's not happening. Instead, investors have simply brushed off the downgrades as nonsense. Could that have something to do with the fact that almost all of China's bondholders are... well, Chinese? Absolutely. In fact, less than 4% of China's bondholders are foreigners. The remaining 96% are domestic investors. And they don't take the pronouncements of the "Big Three" as gospel, as we in the U.S. sometimes do. Instead, they readily play along with the state's interpretation of the facts. As Macro Strategist Eric Fry said, "There are facts... and then there are official government facts. Rarely do the two reside in the same neighborhood. In fact, they often have nothing to do with one another." Chinese investors have no qualms about the downgrades because they believe their government will simply bail out delinquent businesses. But when big business and the state get in bed, it's bound to get messy. Personally, I would stay away from China's stocks and bonds altogether. But if you want some exposure to this market without overdoing it, the best approach is to follow The Oxford Club's asset allocation model. We recommend allocating 10% of your core portfolio to emerging markets. The best way to do this is with a low-cost ETF or mutual fund, like the Vanguard FTSE Emerging Markets ETF (VWO) or Vanguard Emerging Markets Stock Index Fund Investor Shares (VEIEX). This diversified approach will let you access wider growth trends in Asian and Latin American markets without overexposing your portfolio to China. And for more specific opportunities in emerging markets, check out Fry’s Pinnacle Portfolio.